As traditional agriculture comes under scrutiny due to its recounted adverse effects on the environment - depletion of natural resources, contamination of water sources, misuse of synthetic chemical inputs. And usable land for crops declines, growers are continuously looking for alternative and safer ways to grow plants while using less space. This has lead to an explosive surge in soilless production systems within both small growers and large-scale commercial productions. At the forefront of soilless systems are hydroponics and aquaponics, both providing growers with many significant benefits to growing plants while minimizing potentially dangerous environmental effects. Hydroponics is a method of growing plants, without soil, that has been utilized for thousands of years. At first, it may seem contradictory to grow plants without any soil, but hydroponics is an intricate system that works better than the traditional method of growing plants in soil. For plants to flourish they need two things: a set of plant essential nutrients and water. Due to this, if the nutrients are provided within the water and delivered to the roots, there isn’t any need to have soil present in the growing system. In a hydroponic growing system, a nutrient-charged, aquatic solution is flushed through the root zone to provide the plants with the resources needed for optimal growth. 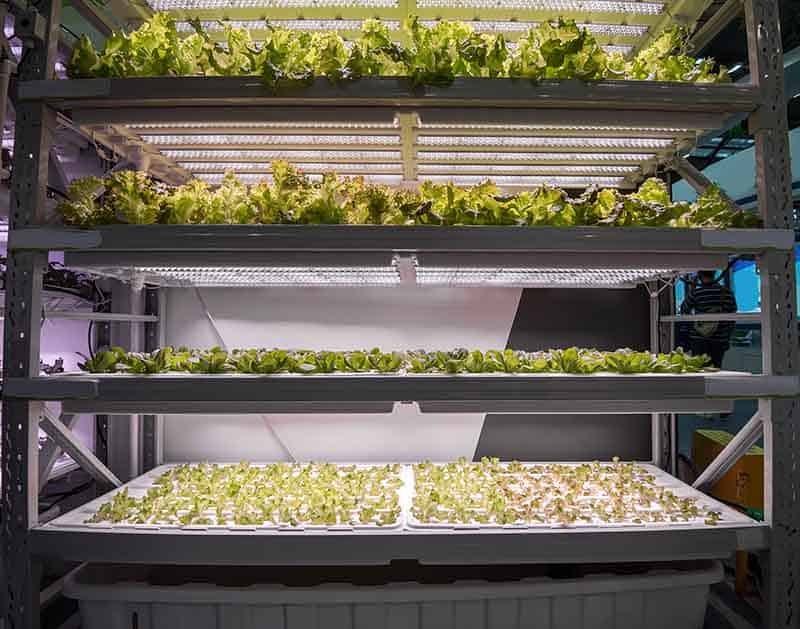 There are many benefits to using hydroponic grow systems: fewer resources are consumed, arable land isn’t needed, and the harvestable plants are of higher quality than when grown using traditional methods. In the last 60 or 70 years, these benefits have increased the popularity of hydroponics, and have expanded the limited possibilities of indoor and urban gardening. Aquaponics is another innovative system of growing plants without any soil to support their root systems but is slightly different than hydroponics. Aquaponics is the combination of growing plants hydroponically and the practice of aquaculture (raising fish). Just as in hydroponics, plants in an aquaponics system are grown in a soilless environment. Instead of plants getting their nutrients from sources in the soil, an aquatic solution provides the essential nutrients needed for plant growth directly to the roots, where efficient nutrient uptake can occur. However, instead of adding fertilizers to the water to provide nutrients, like what is done in hydroponics, fish are grown simultaneously in the aquatic environment to create a symbiotic relationship that results in an incredibly efficient system. In aquaponics, the fish provide a natural source of organic nutrients through their excreted waste; beneficial microbes convert the waste into usable nutrient sources for plants; the plants in turn naturally filter the water, providing a clean living environment for the fish and microbes. In aquaponics, the microbes convert the ammonia from the fish waste into nitrites and then into nitrates. Plants then take in the nitrates through their roots using them as a source for plant essential nitrogen. This combination of hydroponics and aquaculture allows aquaponics to draw upon the benefits of both systems while minimizing the individual drawbacks of each. 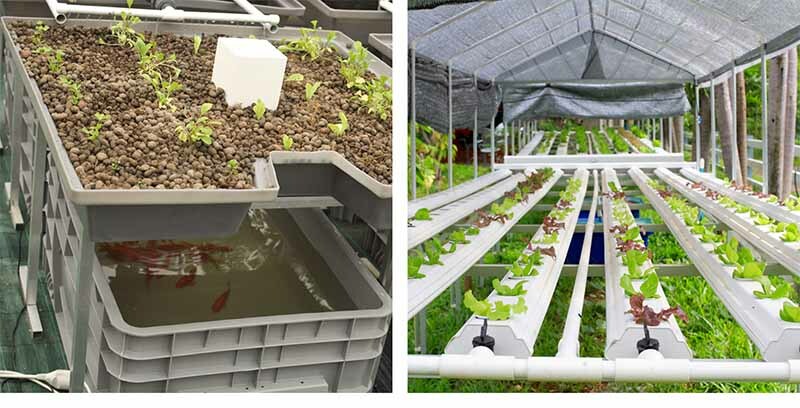 Since aquaponics is the combining of concepts from hydroponics and aquaculture, it’s sensible the two systems have many similarities that make them both beneficial. This may be one of the most attractive similarities between the two systems. Most hydroponics and aquaponics setups are housed indoors, protected from the climate and have supplemental lights for growing. Because of this, it’s possible to grow plants for much longer than the season permits outside. This allows hydroponic and aquaponic growers to provide healthy produce, year-round to areas that may not usually have access in the off-season(s). Plants grown indoors have a much lower incidence of pest and weed pressure. This lower pressure is a direct result of a contained system that can’t be infested due to the wind, soil transfer, migration of pests, etc. Weed seeds are also not distributed by birds or moved from garden bed to garden bed on the wind or gardening implements. Lower pest and weed pressure mean fewer chemical applications that could potentially have negative environmental impacts. Even though plants are grown directly in water in both systems, they use less water overall than traditional gardening because the aquatic solutions are recirculated and reused. An aquaponics system uses about 10% of the water consumed in soil-based gardening. Plants grown in soilless systems grow on average 30-50% faster than those sown directly into the soil. The thought behind the faster growth is due to the extra oxygen available to the roots in an aquatic solution. This extra oxygen stimulates root growth and encourages quicker, more efficient nutrient absorption. The energy saved can be put towards faster growth. On average, plants grown in soilless systems yield approximately 30-40% more than traditional growing methods. This is partly from the careful monitoring of nutrients in the aquatic solutions, guaranteeing plants are receiving optimal levels of food but also the decreased disease and insect pressure, and the more finely tuned growing conditions. 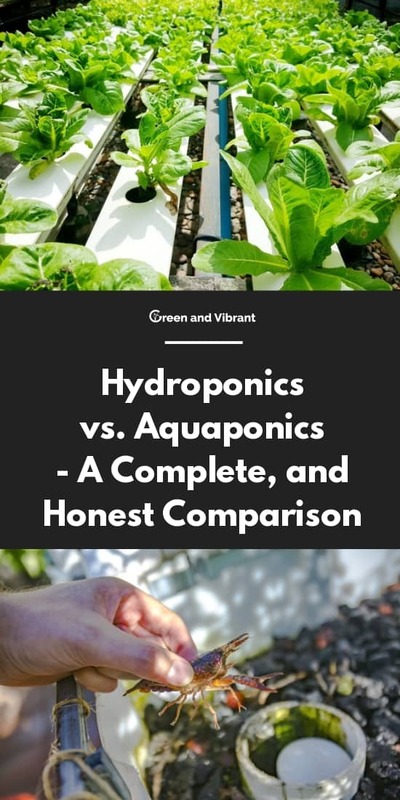 While there are some similarities between hydroponics and aquaponics, the addition of fish to the aquaponics systems creates some differences that are important to mention and consider when contemplating a soilless growing system. One of the biggest design differences in the depth of the grow beds needed. Hydroponics typically utilize 6” deep grow beds as roots can easily spread out within the aquatic solution with little worry of root compaction. Aquaponics needs a minimum of 12” deep grow beds to allow room for the fish to move within their environment. The second difference comes from the varying components. Hydroponics systems are very sterile, and there is no need for any extraneous growing media to support the plants or root systems. Aquaponics, on the other hand, needs an environment around the roots to harbor the beneficial microorganisms. Hydroponics doesn't need deep growing media to support the plants or root systems. Some Hydroponic systems even don't use any growing materials. Disregarding the fish, the startup costs between the hydroponics and aquaponics systems are quite similar. The aquaponics system needs growing media for the microbes to reside in, which adds a little extra startup cost. The big difference though is the cost of purchasing fish to stock the aquaponics grow beds. The cost of fish varies depending on what variety you opt to grow, and how many you will need. A major discrepancy lies in the start speeds between the two systems. After constructing a hydroponics system, it’s only necessary to let the nutrient solution cycle for a couple of days at most to stabilize before adding plants. Aquaponics systems are slower to get up and functional because of the fish. At a minimum, it takes a month to develop the nitrifying bacteria needed to break down the fish waste; most systems can take upwards of 3 months to stabilize the environment enough to introduce plants. Each system has one running cost that differs from the other system. Hydroponics systems need fertilizers purchased throughout the entire growing season to keep replenishing the nutrient solution. Aquaponics has a higher electricity cost since the system requires a higher level of oxygenation in the water to support the fish. Overall, the running costs for aquaponics are slightly more expensive. 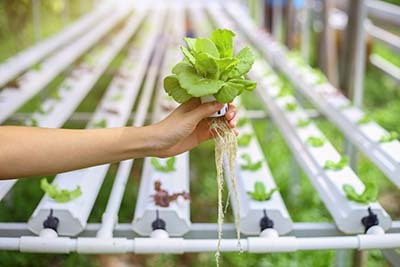 Hydroponics growing systems can be used for plants with high nutrient needs because the nutrient solution can be adapted to meet plant needs; aquaponics systems typically work best to support plants that have lower nutrient needs such as lettuce, other leafy greens, and herbs. An ecosystem is a community of interacting organisms, and the resulting environment created. Hydroponics cannot be considered an ecosystem, while aquaponics can because of the plant/fish/microbe interaction. To be a sustainable something has to be maintained at a steady level without the depletion of natural resources or causing severe ecological damage. Keeping this in mind and we can assume that hydroponics is not sustainable as it needs the nutrients continuously replenished in the aquatic solution. Aquaponics is sustainable as every component is provided and essential for the survival of the system, with minimal inputs needed. The nutrient sources for the feeding solutions are one of the most pronounced differences between the two systems. When growing plants in a hydroponics setting, the grower must periodically regenerate fresh aquatic solution, mixing in fertilizers to create the appropriate nutrient levels. While the nutrient levels are low in aquaponics, the fish waste serves as a natural source of nutrients in the water for proper plant growth. When running any aquatic-based growing system the solution, pH is an essential aspect. The optimum solution pH in hydroponics is 5.5 to 6.0; solutions for aquaponics need to be neutral or only slightly acidic with an optimal level between 6.8 and 7.0 to safely harbor fish. The fish waste generated will naturally create an acidic environment, so it’s crucial to monitor pH levels closely. Electrical conductivity (EC) is an important characteristic of aquatic solutions, determining how well the material will conduct electricity. It measures the salts in a solution, telling how concentrated it is; this is an important aspect of any soilless system that depends on its aquatic solution to provide all of the nourishment for the plants. 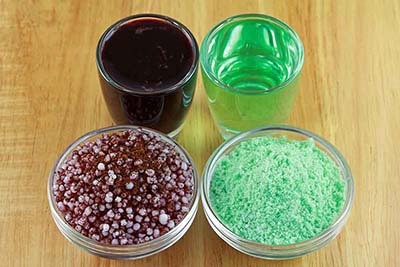 Salts naturally build in hydroponics because of the grower’s need to use salt-based fertilizers to create nutrient solutions. As the nutrient solution is recirculated, the EC can reach dangerously high levels, damaging the plants. This makes it a necessity to check EC regularly in hydroponics. Organic waste from fish has very little salts in it, so a high electrical conductivity in the aquatic solution in aquaponics is rarely ever a concern. Warm water is a perfect breeding ground for fungus, making it necessary to keep the aquatic temperature lower for hydroponic systems than aquaponics. In aquaponics though, the microbes and fish seem to keep fungus at bay, and the water temperature can be higher. It’s recommended to keep the water temperature below 70°F in hydroponics and between 82 - 86°F for aquaponics. The fungal disease pythium, commonly known as root rot, is a prevalent problem in hydroponics. A lower water temperature and sterile environment helps to lessen the incidence but doesn’t eradicate it completely. On the other hand, Pythium is almost non-existent in aquaponics. This is thought to be a direct result of the microbes in the aquaponics system, and the resulting strength in the immunity of the plant grown in that environment. Both soilless systems have significantly fewer insect problems that soil-based gardening. Some insects such as spider mites, aphids, and thrips can become problematic in either system, but insect control is considerably more challenging in aquaponics. Hydroponic growers can apply pesticides to eradicate insects; non-chemical methods have to be employed in aquaponics to keep from harming the fish. After the system is stabilized and running at its prime, there is much less monitoring needed in growing with aquaponics than hydroponics. The aquatic solution in hydroponics needs to be monitored much more closely to check the EC, the pH, total dissolved solids, and the nutrient concentrations; an aquaponics solution needs to be checked for pH and ammonia levels weekly or if the fish seem stressed. With aquaponics too, there is no need to flush and replace the nutrient solution because of its sustainability and naturally occurring processes that keep nutrient levels in check. In hydroponics, it’s necessary to periodically drain the aquatic solution and replenish it with a new batch as salts become concentrated. Problems with the functioning of the system components can be trouble in either system but is a bigger concern in aquaponics. In hydroponics, the water is filtered much less frequently (every 4-6 hours) than in aquaponics (every 15-45 minutes), so the system can withstand being down for a more extended period. Aquaponics solutions are also more prone to mechanical failure because the fish waste can clog the system. The last major difference between the two systems is waste disposal. As mentioned before, the water used in hydroponic systems needs to be periodically dumped, then the new solution is added. Disposal of this fertilizer-rich water into natural bodies of water or down the drain can have inherent risk; in aquaponics, the only component in the aquatic solution is the fish waste not broken down by the microbes and can be safely disposed of down the drain. Which one is better? Does it really matter? Now comes the big question, is one of the two systems better than the other? Both hydroponics and aquaponics have clear benefits over soil-based gardening: lessened, adverse environmental impacts, reduced consumption of resources, faster plant growth, and higher yields. Many believe that aquaponics is a better option over hydroponics when choosing a soilless growing system. The addition of fish to the system generates nitrifying bacteria that break down the fish waste into a plant-usable source of nitrogen; this creates an almost entirely self-sufficient, utterly sustainable ecosystem. An aquaponics system also has less day to day maintenance once the system is up and functioning at its peak. The aquatic solution doesn’t need to be refreshed/replenished due to increasing salt concentrations. It requires less monitoring and can be disposed of much more easily than the aquatic solution from a hydroponics growing setup. However, truth be told, Hydroponics is more widely used by hobbyists as well as commercial growers. It is easy to anticipate that because Hydroponics is easier to set up, looks much cleaner indoors, costs less, and most importantly has more and faster ROI (Return on Investment). So I cannot answer the question above. And I'm assure no one can help you with the choice between Hydroponics & Aquaponics as well. And in fact, it doesn't really matter which is better. As a grower, you should choose which system based on your needs or sometimes your liking. The most important factors, to me, are what you can get from the system you build, and how much you enjoy it. Growing plants in soilless systems is becoming increasingly popular and provides the grower with many distinct advantages over traditional methodology. Two basic systems are popular amongst homeowners: hydroponics that solely grows plants within its contained and aquaponics which combines hydroponics with raising fish. Both systems have similarities and differences that must be considered before starting a project of this scale. 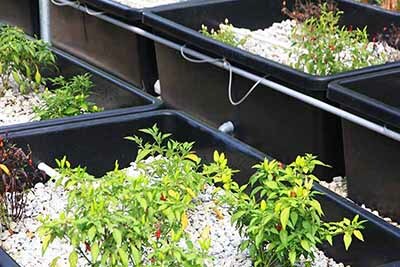 While many believe aquaponics is the better option mostly because of its sustainability, both have distinct advantages over growing plants in a soil-based garden.